Since the debut of the original RK5 in 2014, Richie’s needs have changed, both on and off the road. Therefore, Tech 21 developed a version 2 to incorporate some new features and follow the same form factor as later Fly Rigs. In addition to incorporating effects, new to this version is an on/off button for the SansAmp section. 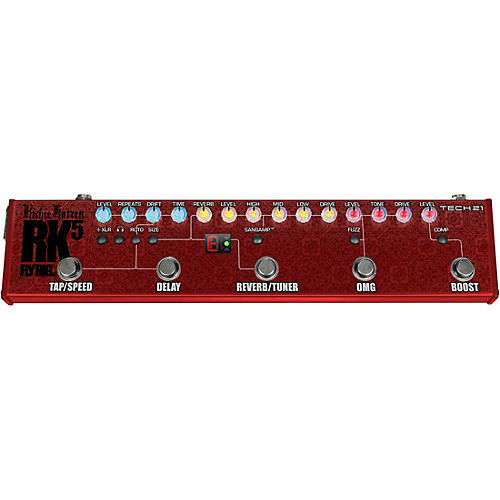 Richie previously would use his RK5 both with and without the SansAmp engaged. Currently, it’s either on or off during stage shows, so he no longer needs a dedicated footswitch. Focuses on cleaner tones within the tube amplifier sound spectrum. To dirty things up, you have the flexibility of using the Drive control, the Boost function, or you can add overdrive from the OMG section. Or all three. Each method achieves different tones. The all-analog SansAmp technology enables the RK5 to run directly into mixers of recording desks and PA systems, as well as augment your existing amplifier set-up. Independent pre-Boost for solos, up to approx 12dB. A COMP Switch engages old school, all-analog, FET-based technology from the ‘50s and ‘60s, which is inherently warmer, more transparent and more musical than other methods of compression. Based upon the Richie Kotzen Signature OMG pedal, which provides a wide range of overdrive, from clean to aggressive. You can add personality to a clean amp or use it for extra punch with a dirty amp tone. A FUZZ switch changes the character and attack of the overdrive to a fuzz-style tone, making it thicker and woolier. Voiced for the sounds of a vintage tape echo, it features Time and Repeats controls and dedicated Tap Tempo footswitch. A Drift control adds a random, unpredictable element to the modulation. A ROTO switch changes the Delay function into a rotating speaker effect and the Tap Tempo then controls the speed. It ramps up from slow to fast gradually. Drift then controls the distance of the virtual mic to the rotating speaker. At maximum, it adds a tremolo-like effect by modulating the volume in sync with the tonal modulation. Chromatic Tuner, operable via the REVERB/TUNER footswitch. You simply hold the footswitch down to engage, which simultaneously mutes the signal path.